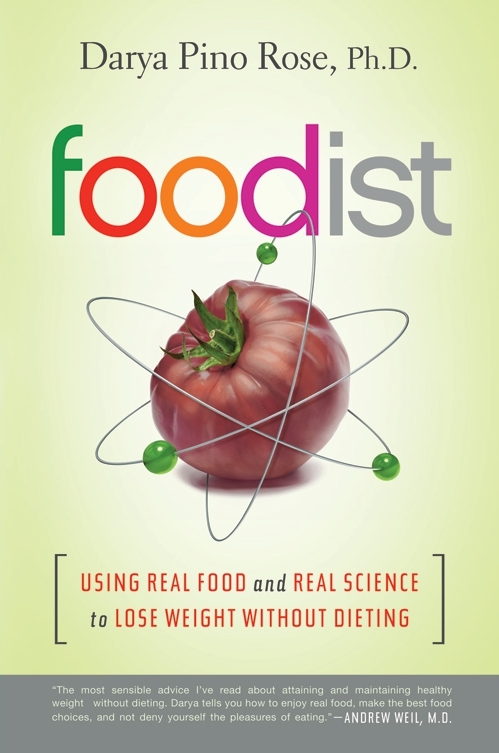 I was asked to review the new book, Foodist: Using Real Food and Real Science to Lose Weight Without Dieting by Darya Pino Rose, Ph.D. I said yes immediately because it sounded like the type of book I would want to read. I’m less interested in reading books about diet fads and more into the science behind healthy eating. The book was written by the blogger behind SummerTomato. I hadn’t read her blog before I received the book and went into it thinking I was reading a book written by a doctor who specializes in nutrition. I was impressed with how easy to read it was and then realized, OH! It’s written by a blogger! I learned pretty early on that I would not be successful if I was sacrificing everything I loved. I didn’t want to eat a diet of iceburg lettuce with no dressing and plain chicken breast with no flavor! If we change our mindset from dieting to learning to live healthy, I think we’ll all be more successful. I appreciated the author’s real-life suggestions. She called herself a “Foodist” and I liked the term. Basically it meant that she ate real food and focused on healthy choices, without severe restriction. There were parts of the book that felt like I was reading a blog post. The subjects were things like: 9 Surefire Ways to Sabotage Your Weight Loss [pg 22], 10 Simple Ways to Eat Less Without Noticing [pg41], 10 Simple Goals to Get you Started Eating Healthy [pg108]. But they did have useful advice. 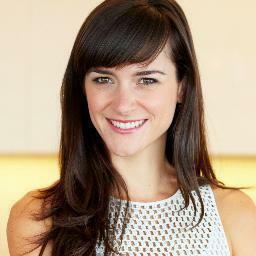 She talks about how to build successful habits and she suggests choosing simple, specific goals. “For example, ‘Eat more vegetables’ is a less useful goal than ‘Eat green vegetables every day with lunch and dinner.’ These clear goals are effective because there is no wiggle room. [pg 49]” YES! Make specific goals! It’s crucial to success! Seriously?!?! A Krispy Kreme donut is a healthier choice than Yoplait? That is kind of sad if you think about it. It just goes to show you how much junk is in processed food. The above quote from the book really hit home for me. I wondered about my own routines and habits. I often get the munchies after dinner is over. Why? Do I need to take a look at what I’m eating? Do I need more carbs or protein in my dinner to sustain me? It’s something I need to look into. YES! This is totally me. I am so used to having veggies with every single dinner that if I don’t, the dinner feels incomplete. I am totally that person that will make a salad or heat up some green beans to go along with my slice of pizza. That chapter of her book talked about creating healthy habits and I am living proof that you CAN change your habits for the better and they will become your norm. While I enjoyed the book, I wouldn’t say it’s really for me. I already lost my weight and I’ve kept it off for 5 years. I think this book is more geared toward the person just starting out or contemplating losing weight. In that case, this book is an excellent starting point and I recommend it to anyone interested in losing weight. I get to give away one copy of the book to a US/Canadian citizen. To enter, follow the instructions below! 1. Leave a comment here about anything related to this topic. 2. Tweet “I want to lose weight in a healthy way with @lisaeirene http://wp.me/p116Lc-9XT” and leave a comment here telling me you did. 3. Join my Facebook group and leave a comment here telling me you did. You can enter three times. I will pick a winner on Friday, May 24th. Good luck! I’m really interested in reading this book (honestly, If I don’t win I’ll probably buy it anyways!). When I started my weight loss journey 50 pounds ago, I was all about the processed foods and anything “easy”. I hit a wall with that and just couldn’t do it anymore, and since then have been trying to lose weight successfully while eating a diet of mainly real foods. Coupled with a work class run by a nutritionist It’s really made me want to push forward with doing this, especially knowing that I may not lose as quickly (since sometimes the processed stuff is less calories), but I’ll be striving towards a more balanced life. Reading this book would definietly help me to continue to open my eyes! Way to go on 50 pounds so far. I started following your blog and found you through Diane’s Fit to the Finish. Your blog is excellent and I will continue to read and follow your wonderful posts. I am nowhere near Marie’s 50 lb loss (way to go Marie! ), but am at half that and still have 70 lbs to go. I would say this book would be a great help but if I don’t win, I will also likely buy it anyway. I do have to agree that once you start on the veggies and healthy foods, I find I crave them if I ease off for a couple of days – even getting cranky without them. Thank you for checking out my blog and sticking around! I agree, my meals feel incomplete when I don’t have veggies! I’m already a member of the FB group. And I’d really, REALLY like to win the book! I would love to read this book! I lost about 80 pounds last year from diet and exercise but I am having a hard time keeping it off. Trying to find a way to have a “normal” life where sometimes I can eat my cae and keep the pounds off and I think this book would help me! Congrats on 80 pounds! You should be very proud of yourself. Diane Fit to the Finish recently posted..Diet Drinks: Part of Your Weight Loss Diet or Not? I think you’d like it, Diane. LOL I get asked to review books all the freaking time… and not once has it been a book I’d actually want to read. Even worse, they’ve all been digital only. 🙁 I would like to read this one though! Off to tweet now! Miz recently posted..She’s a tiny Buddha covered in pink. The book sounds interesting. I was just looking at the nutrition info on the back of a Yoplait yogurt last night. While this version was only 90 calories, there was still 10 grams of sugar. So with a gram of sugar typically equaling around 4 calories, that meant that 40 calories (out of 90) were from sugar! Thanks for such a well-thought-out review for the tour! Thanks for thinking of me for the tour. I enjoyed the book.